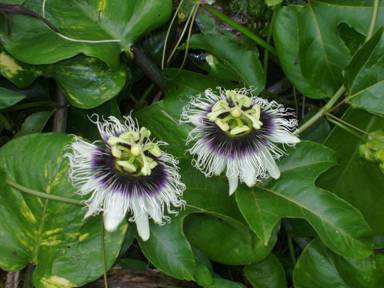 The intricate flower of the Passion Fruit, Lilikoi in Hawaiian, was named by the first Christian missionaries landing in South America in the sixteenth century, who called it the passion flower because they thought that it symbolized the death of Christ. The five sepals and five petals of the flower represent the disciples without Peter and Judas. The double row of filaments signifies the halo around Christ's head to some, and the crown of thorns to others. The five stamens and the three spreading styles with their flattened heads symbolize the wounds and the nails respectively. While this all seems a bit reaching to me, I thoroughly enjoy the beautiful flowers of our Lilikoi vines this time of year, and enjoy even more the fragrant and tart fruit in the fall and early winter. Lilikoi jam, sauce, cheesecake, and margaritas are sorely missed in July, when even the frozen juice has been all used up.